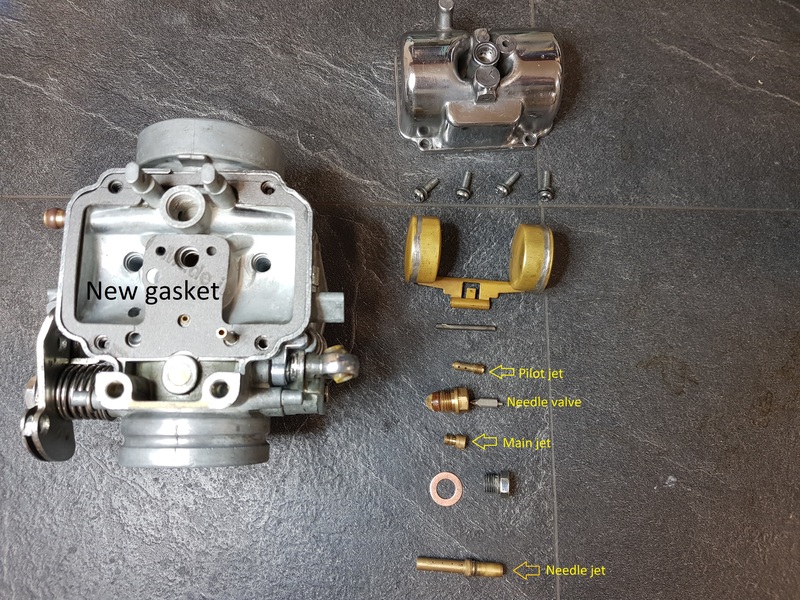 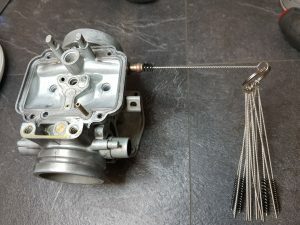 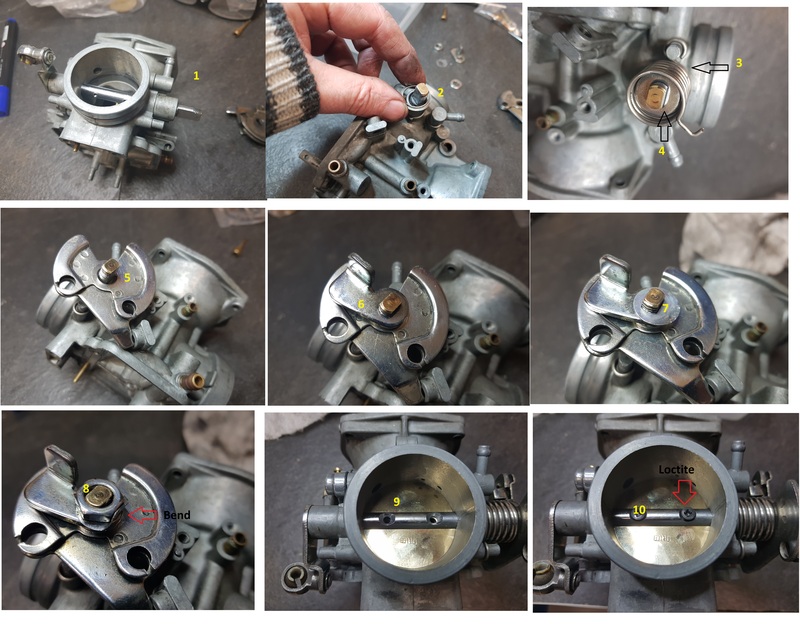 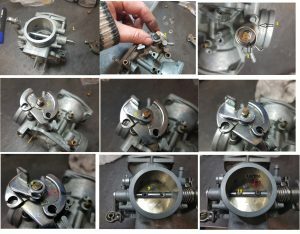 The assembly process are very much the same for all three.Please see the previous posts for the left and right carb. 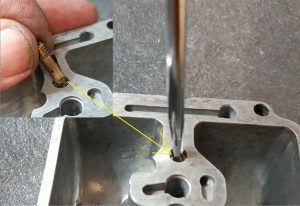 Do the same for the center one except from the bracket at the end. 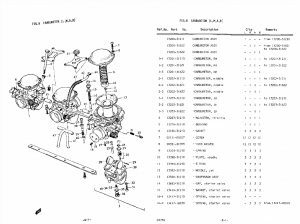 As always, click on the images for detailed view. 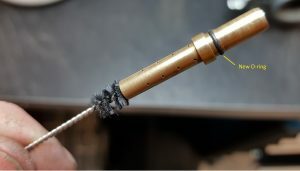 Add some grease on the both ends of the shaft. Insert the seal with the lips facing outwards. 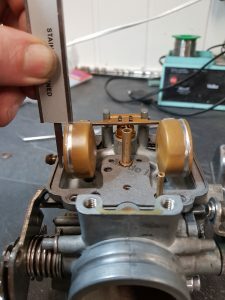 Two seals, one for each end. 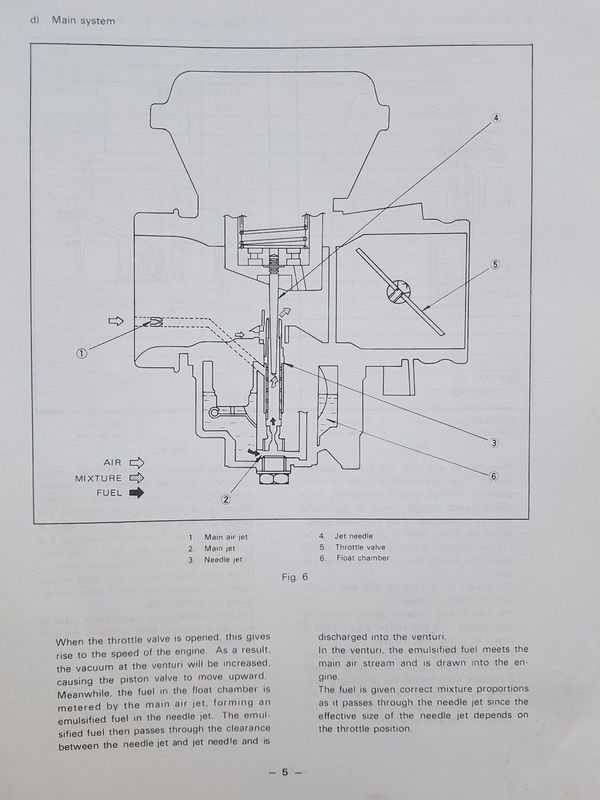 Insert the shaft and the butterfly valve. 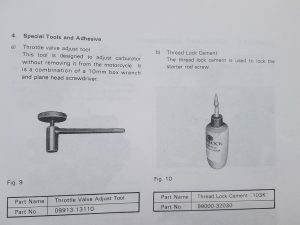 Secure the screws with loctite. 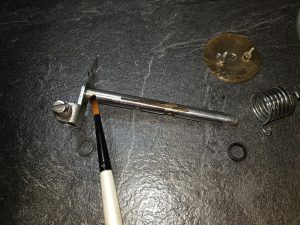 Use new screws if they are worn. 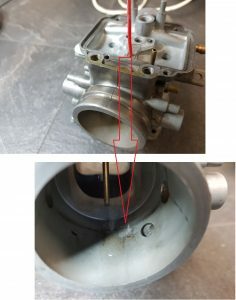 Make sure the valve sits well and is the correct position. 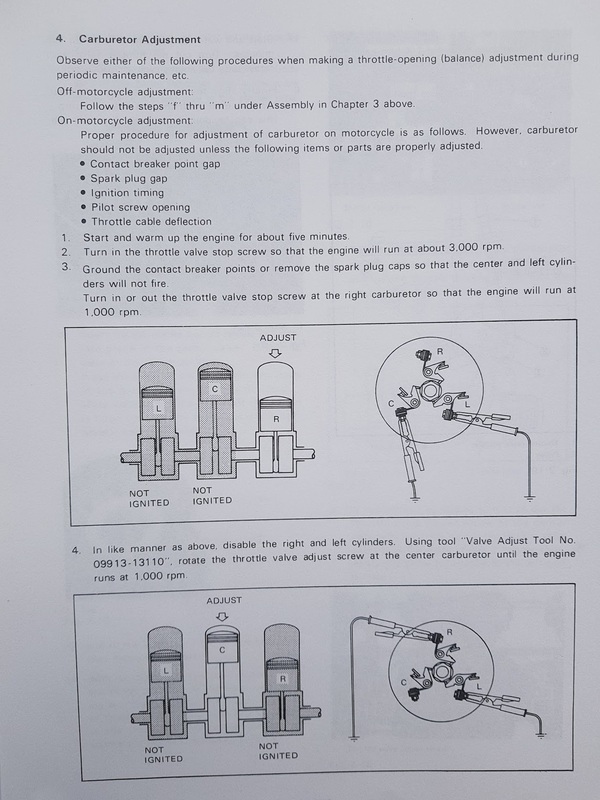 If not you will get trouble later on doing the synchronization ( balancing ) of the carbs. 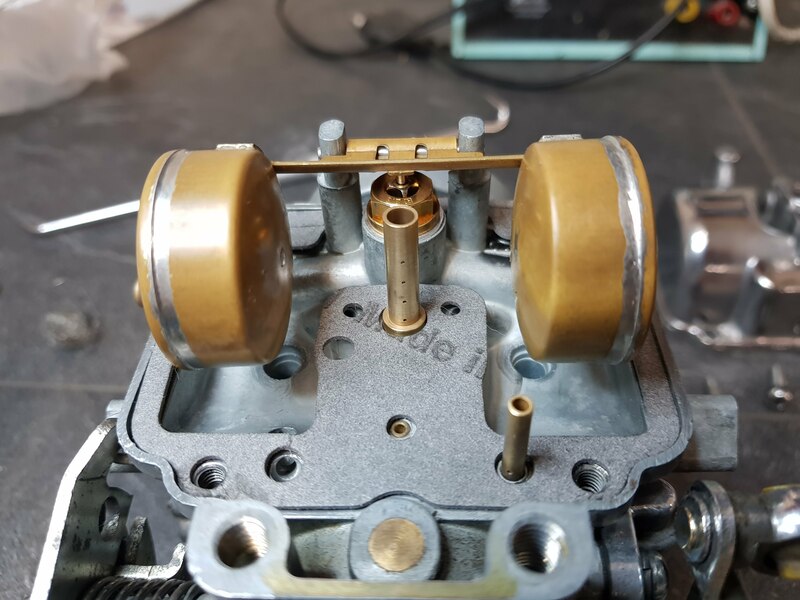 Most of the parts got some seconds or minutes on the polishing machine before mounting, the spring as well. 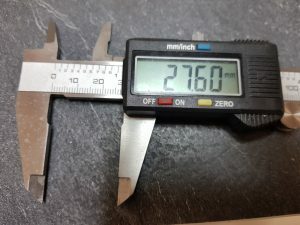 Looks so much better. 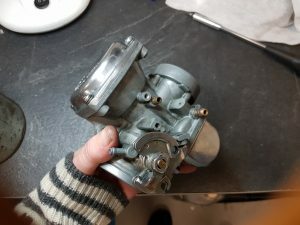 Parts to be mounted in the carb top. 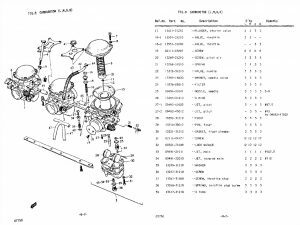 Click on images for detailed view. 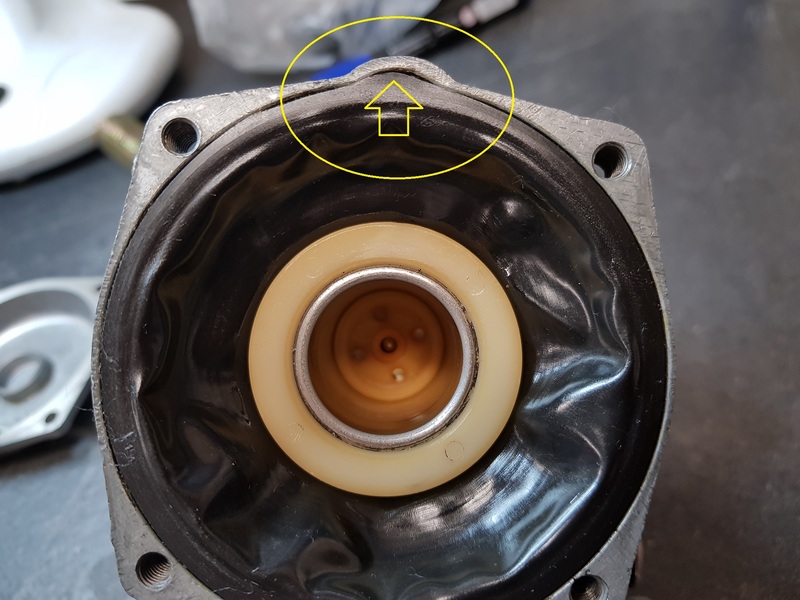 The normal position of the circlip should be in the middle, not like the one on the picture. 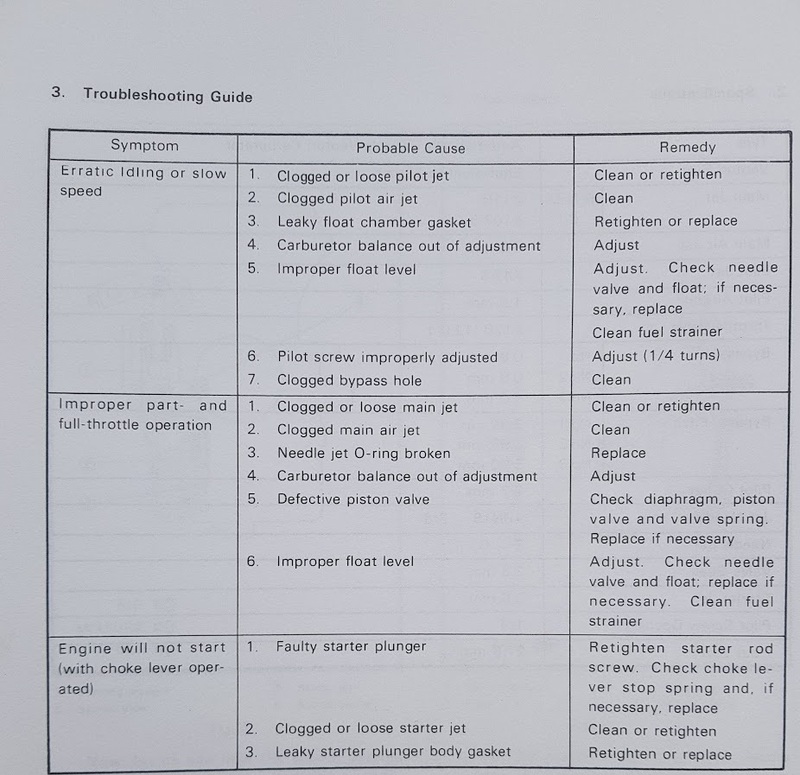 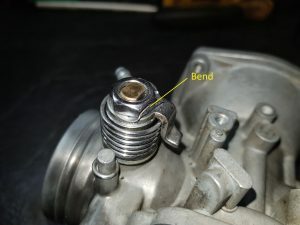 Adjustment can be done to get a better temperature on the spark plug. 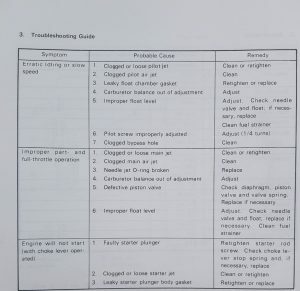 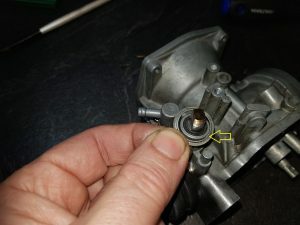 Do not change the original needle with an aftermarket one if the original is OK and not worn. 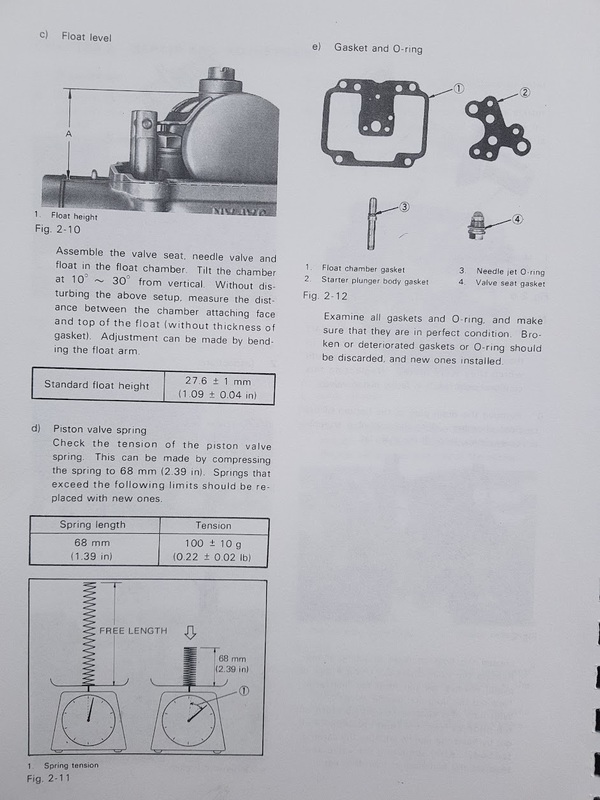 You can check the tension and length of the spring according to the service manual. 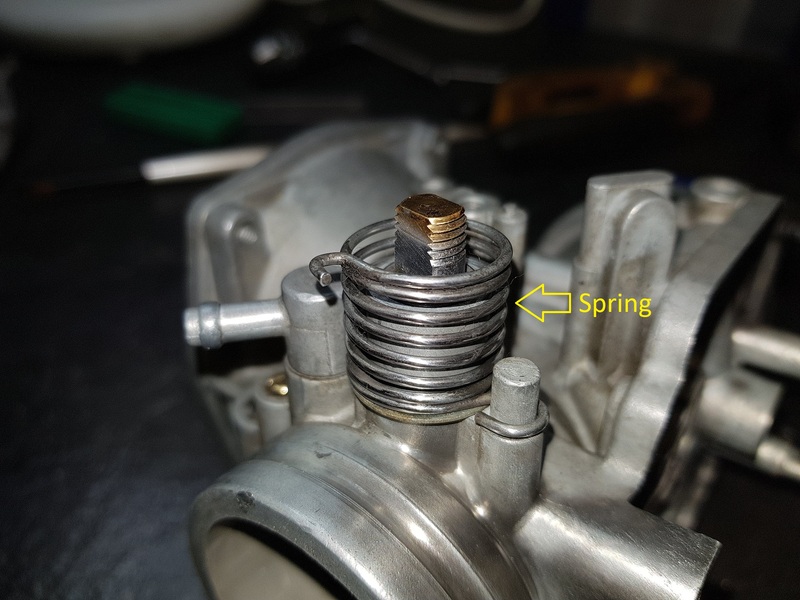 It’s more important to check that all three spring has the same length. 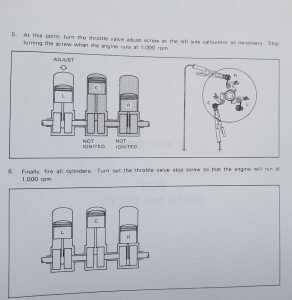 That will be important later on when you are doing the syncronization of the carbs. 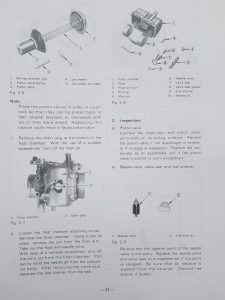 Get a new one and proceed. 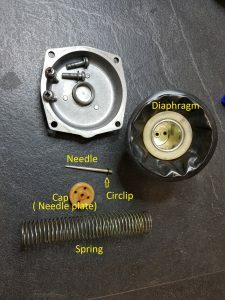 Install the diaphragm , note the position shown by the arrow. Mount the spring and the top cover. Test the diaphragm by pushing the piston up and hold you finger above the intake hole. 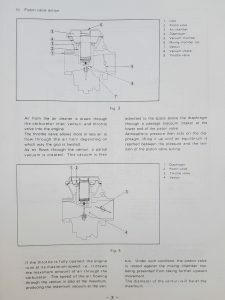 The piston should stay stable, or move very slow. Release our finger and the piston shall go down. 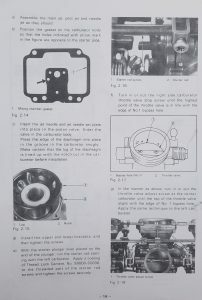 Click on the images for detailed view. 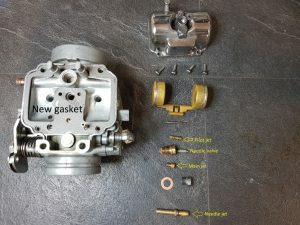 Install a new gasket. 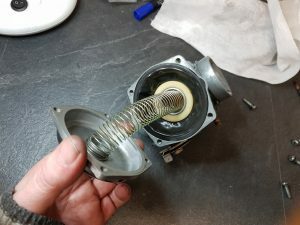 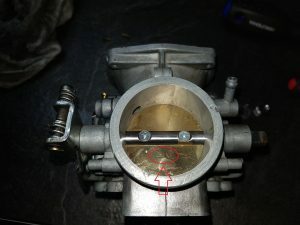 Some of the aftermarket kit might require some trimming of the gasket. 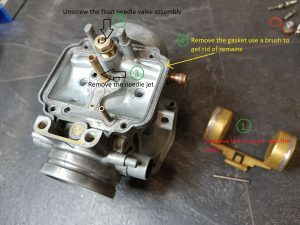 If the original gasket is an a good shape, keep it and don’t replace it. 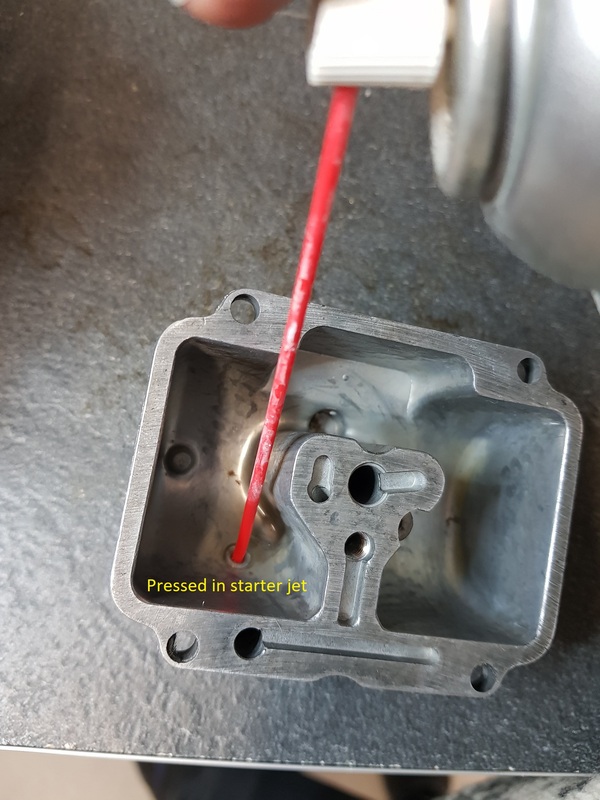 Install the needle valve. 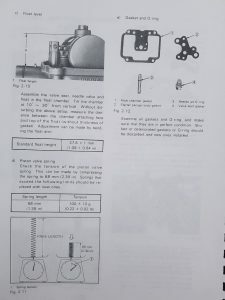 Don’t forget the washer. 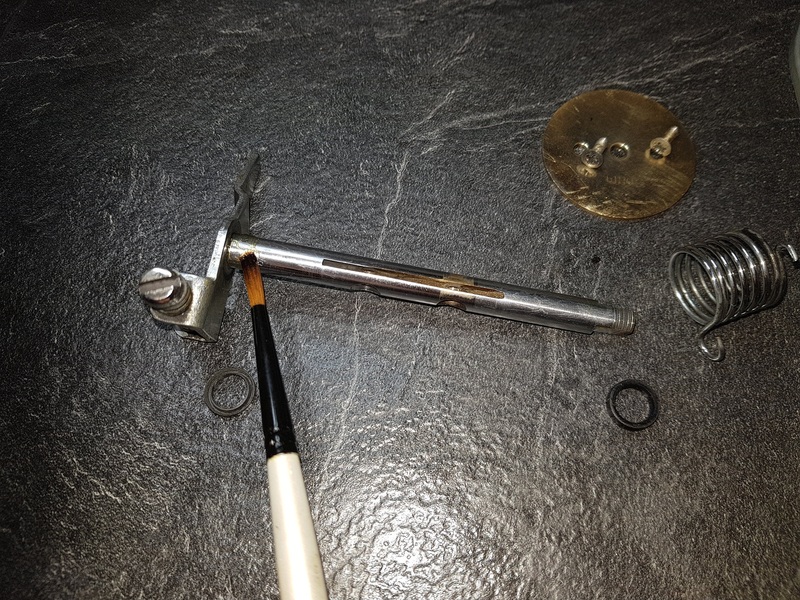 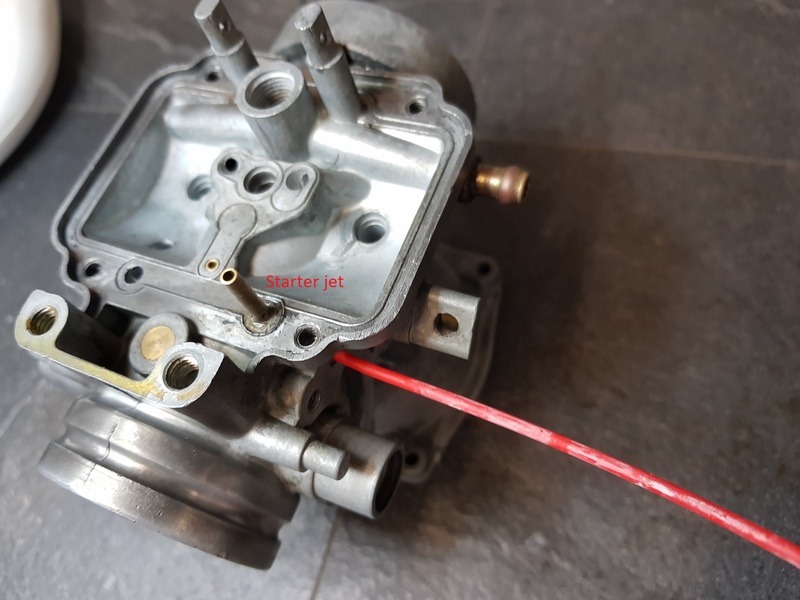 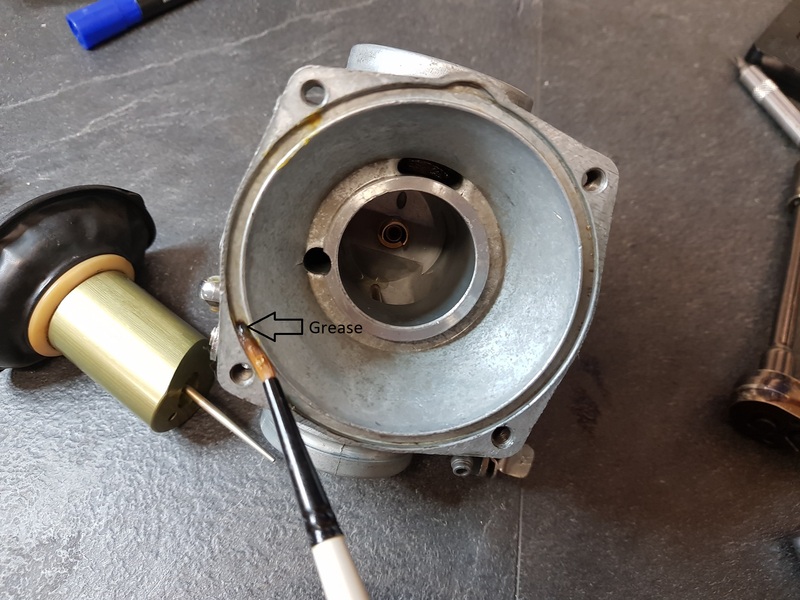 Clean the needle jet before mounting using brush, carb cleaner and compressed air. Mount the needle jet and the float. 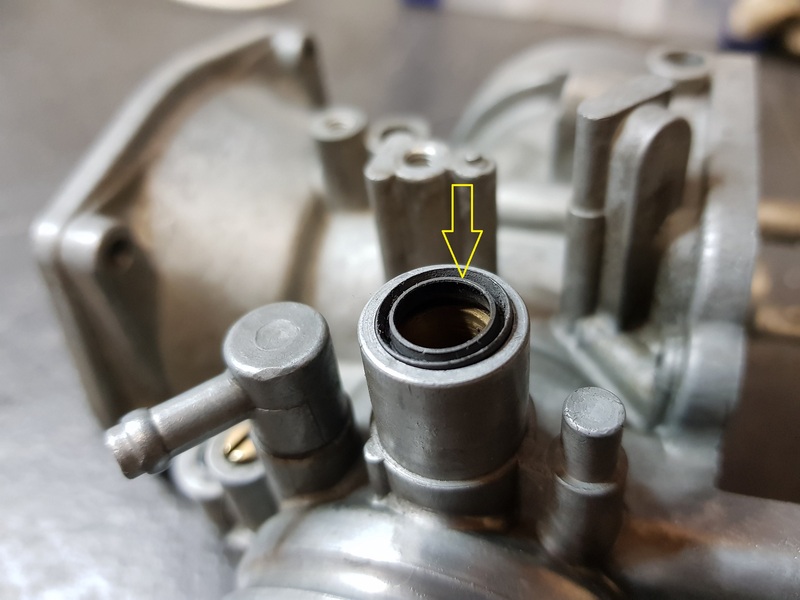 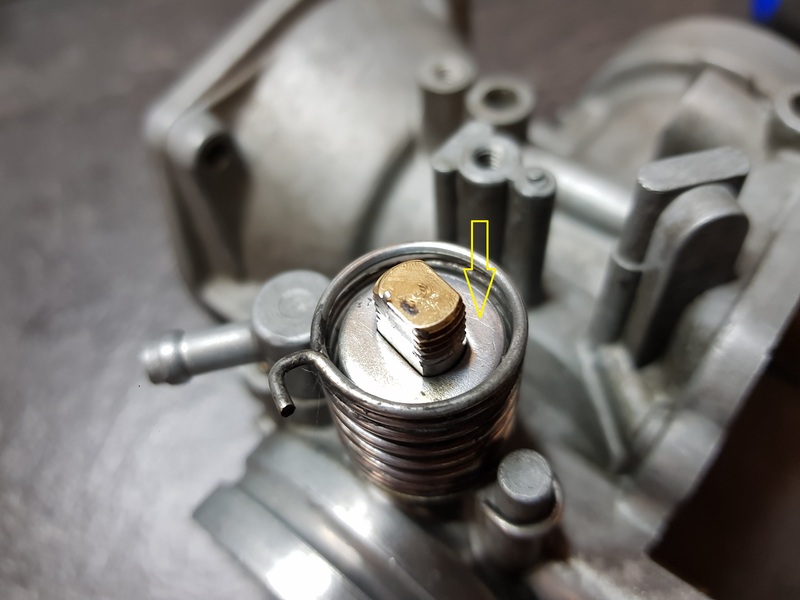 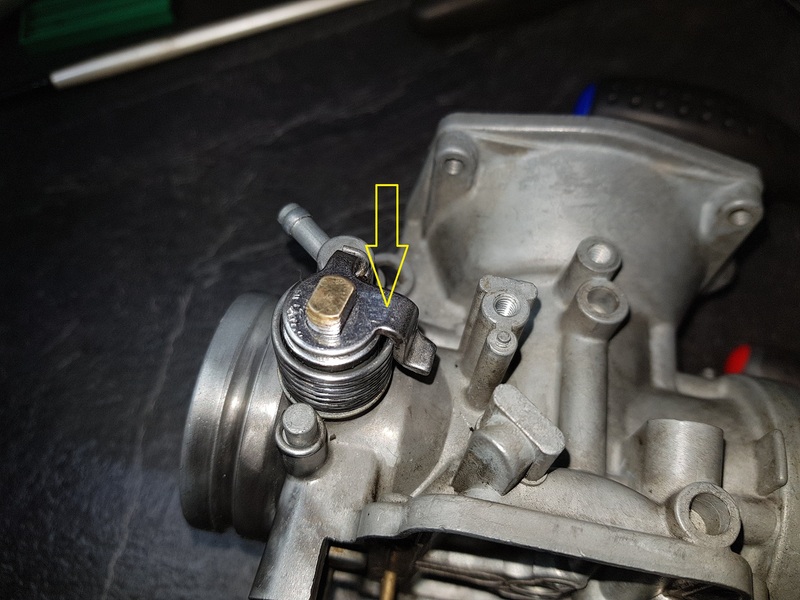 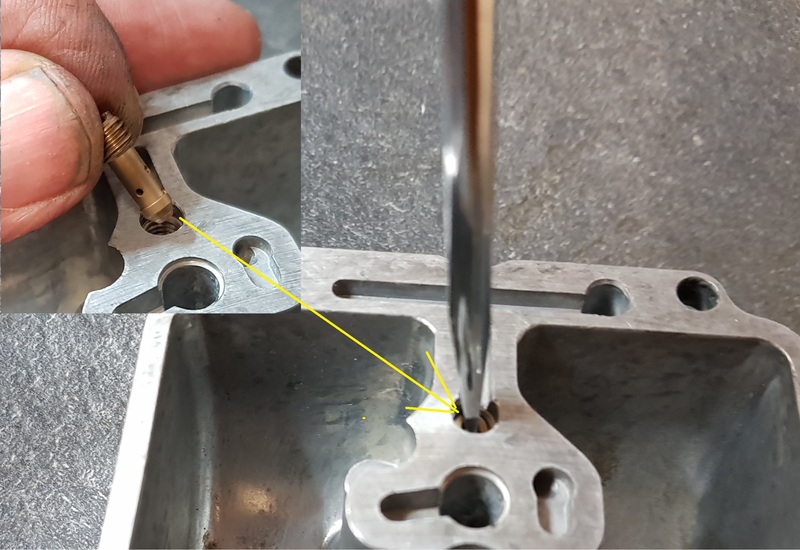 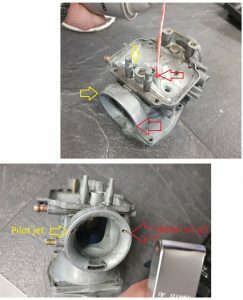 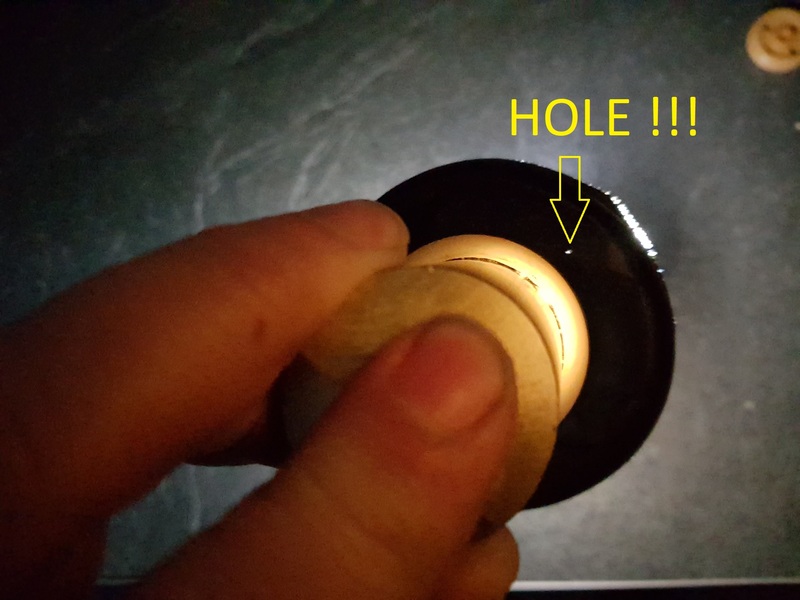 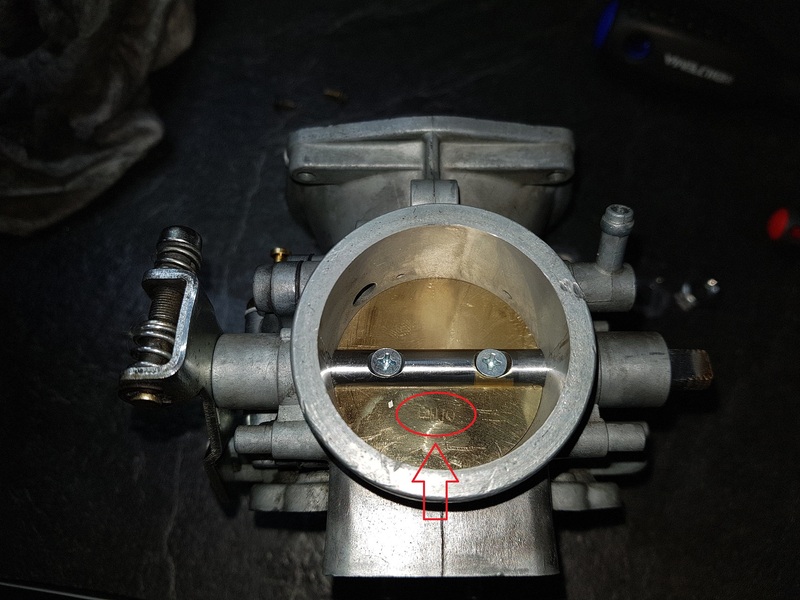 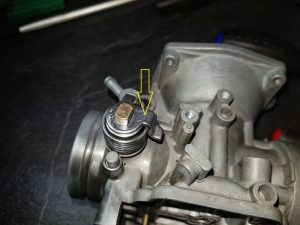 You can easily check the function of the valve by blowing air from you lungs into the fuel inlet and hold one finger on the outlet on the other side. By lifting the float up and down you will sense if the flow turn on and off when the valve is activated. Adjust the height of the float by measuring from top of the float and down to the chamber attaching face. 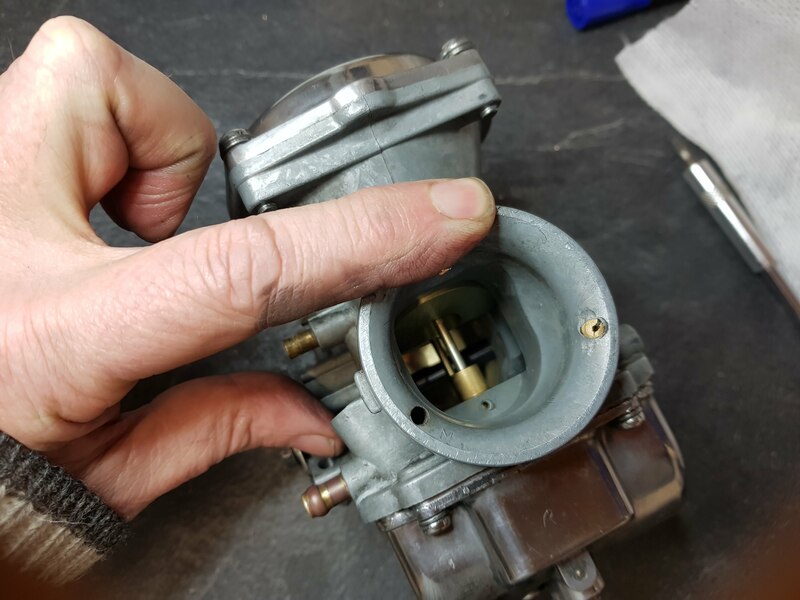 Not down to the gasket as it’s done on the photo. 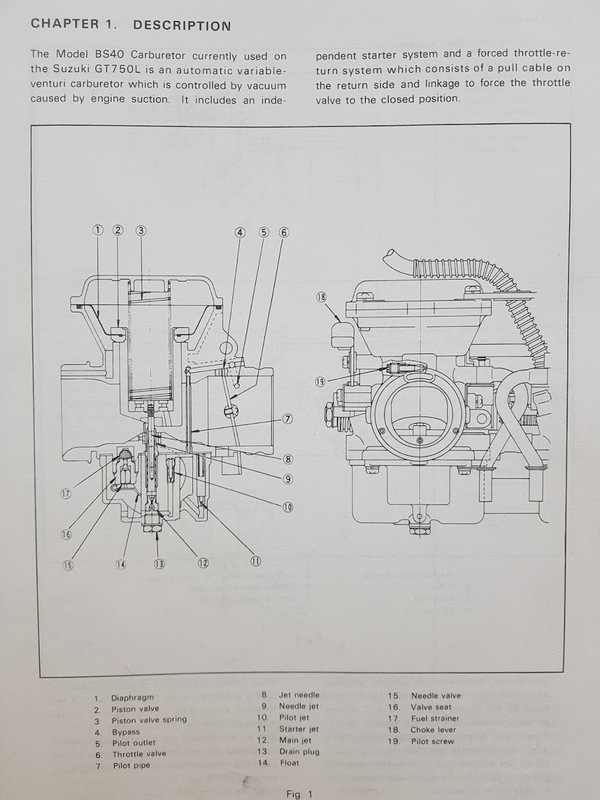 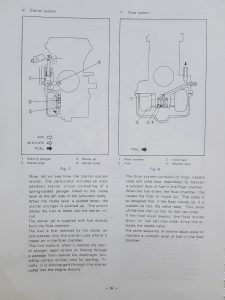 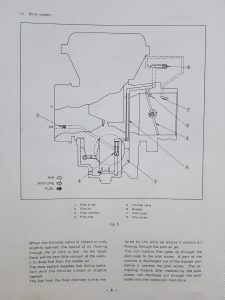 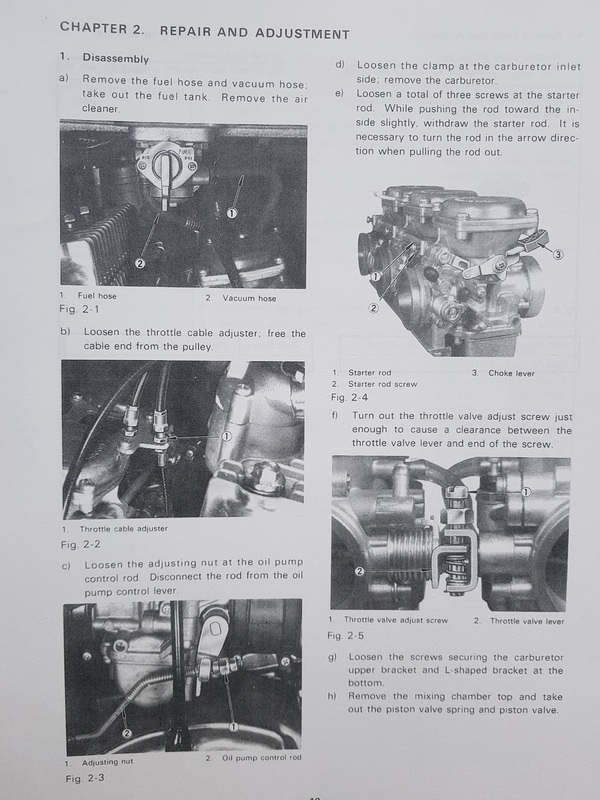 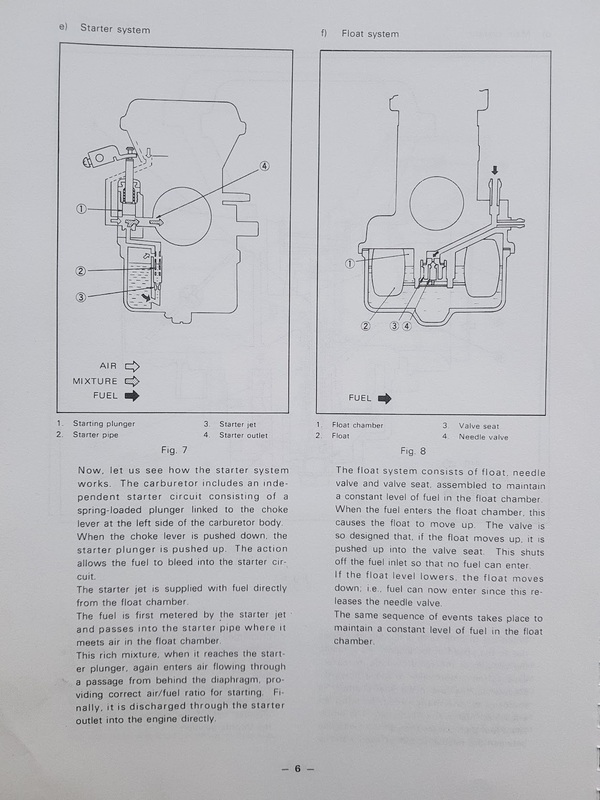 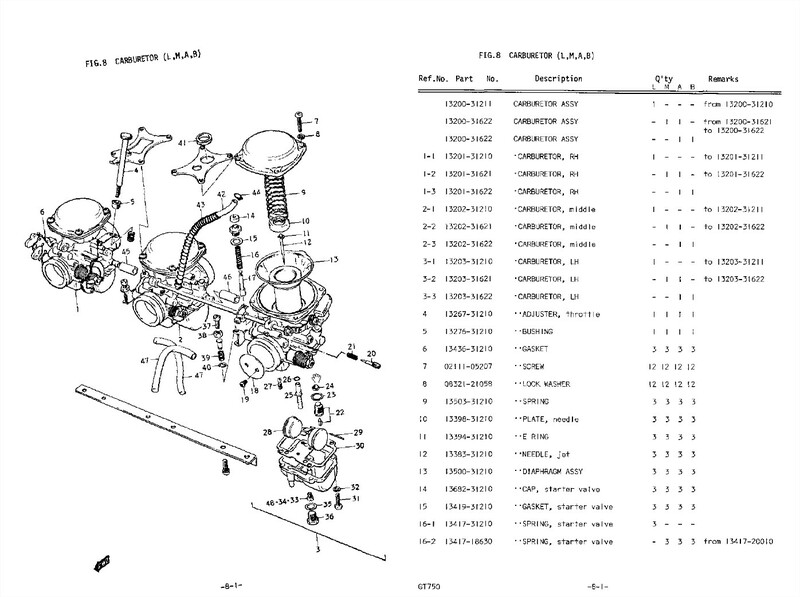 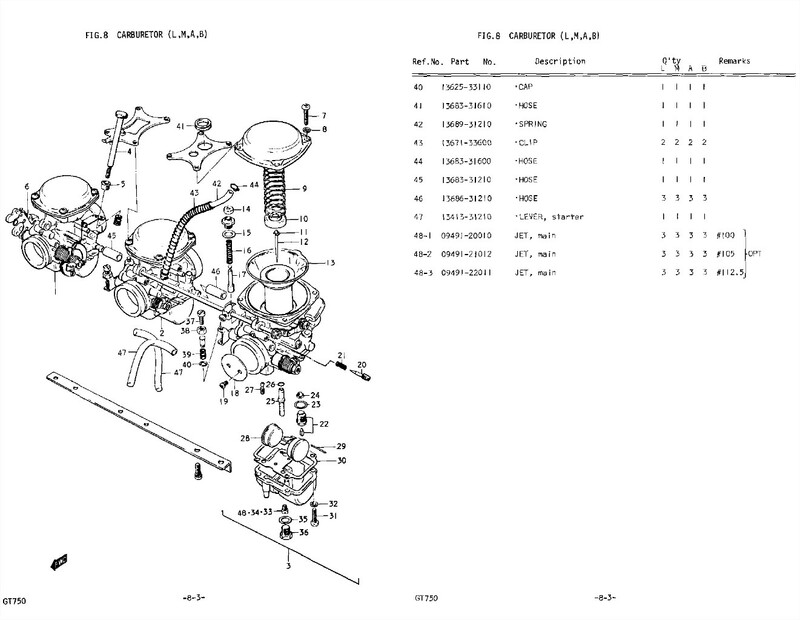 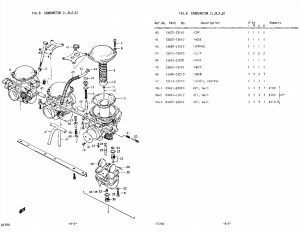 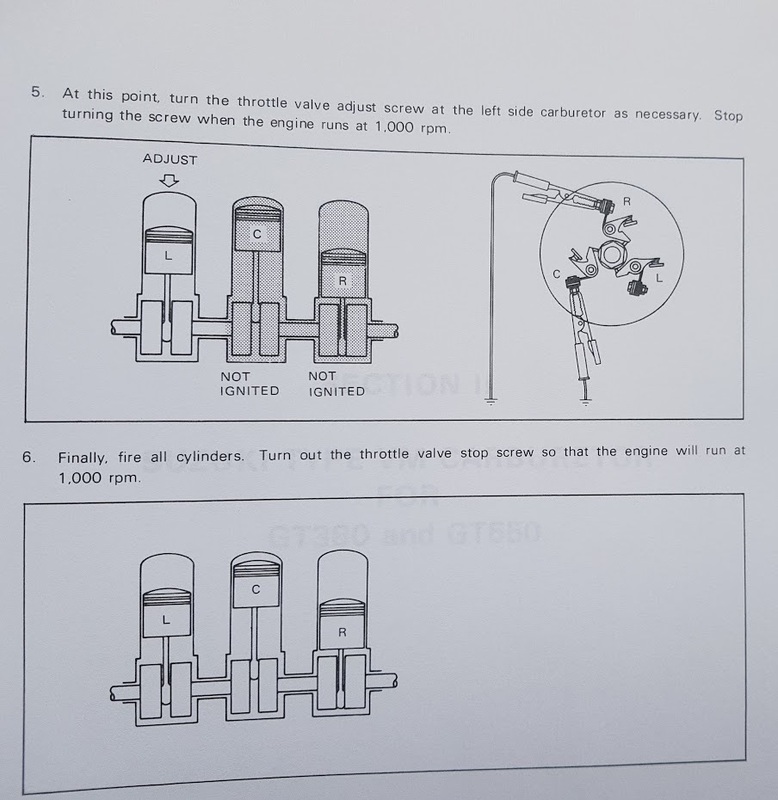 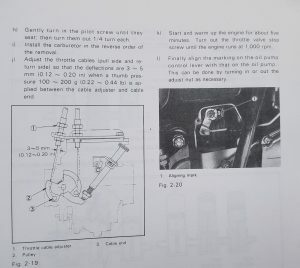 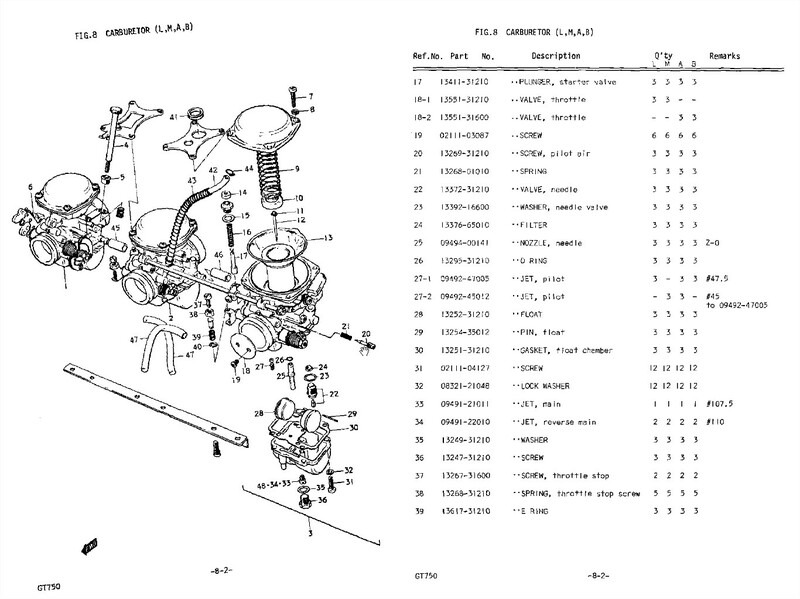 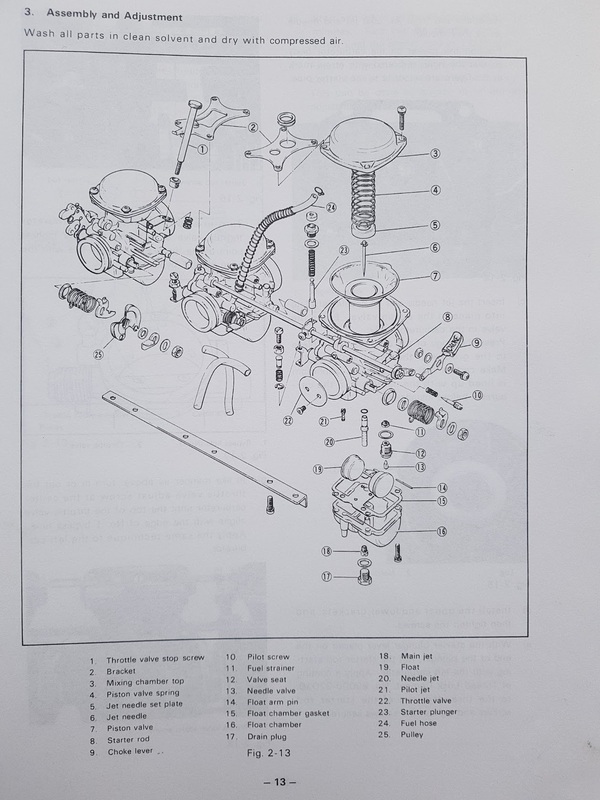 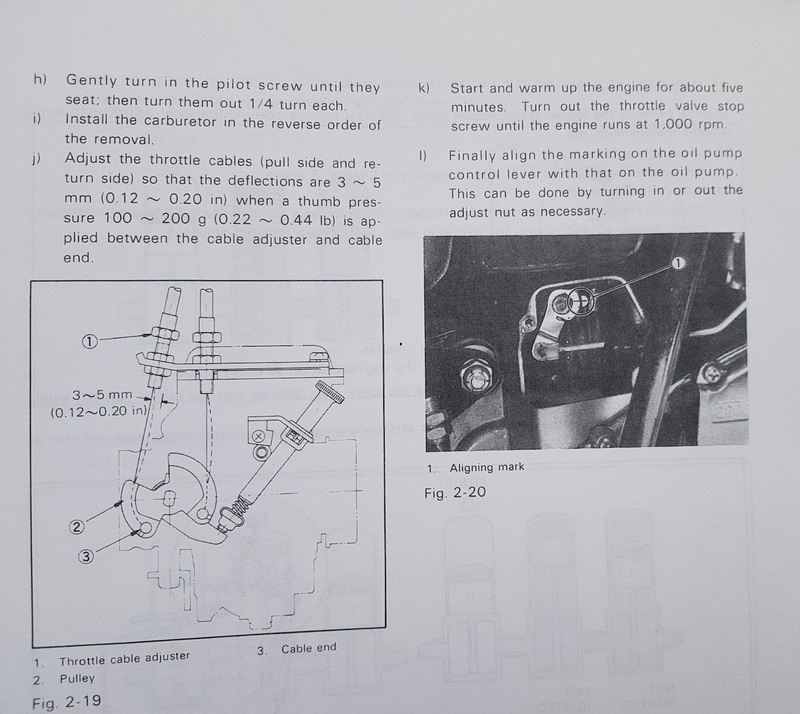 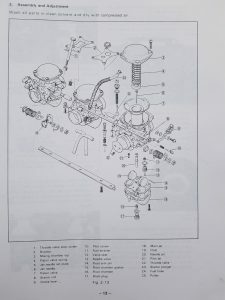 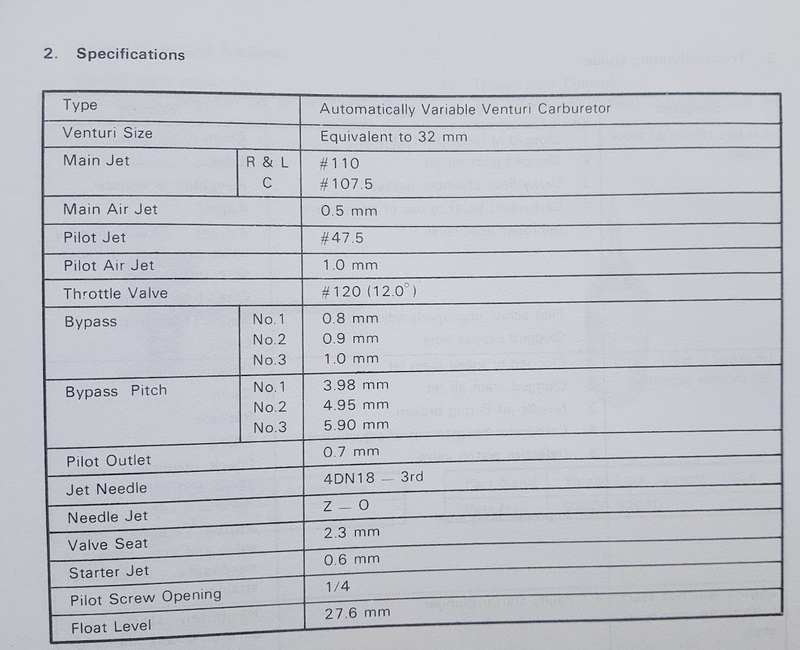 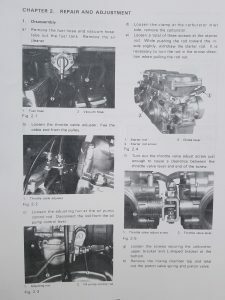 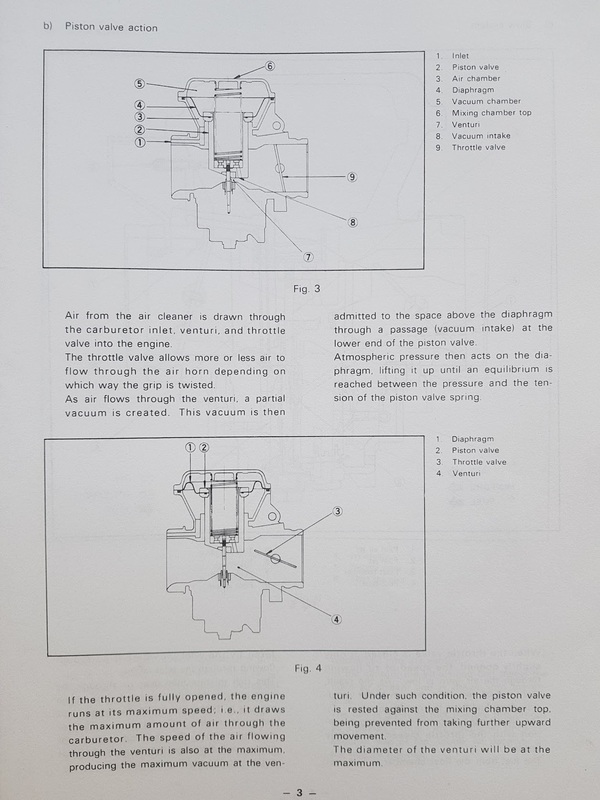 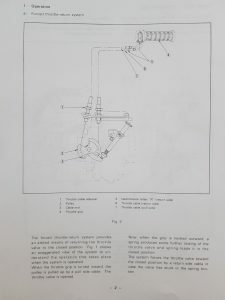 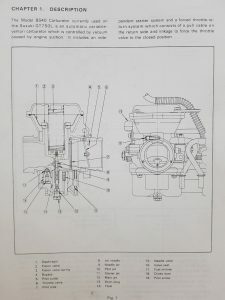 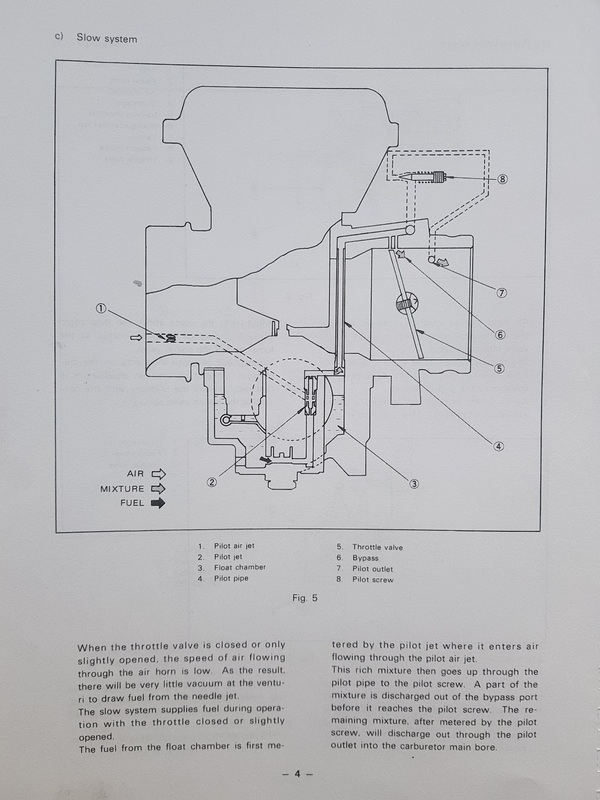 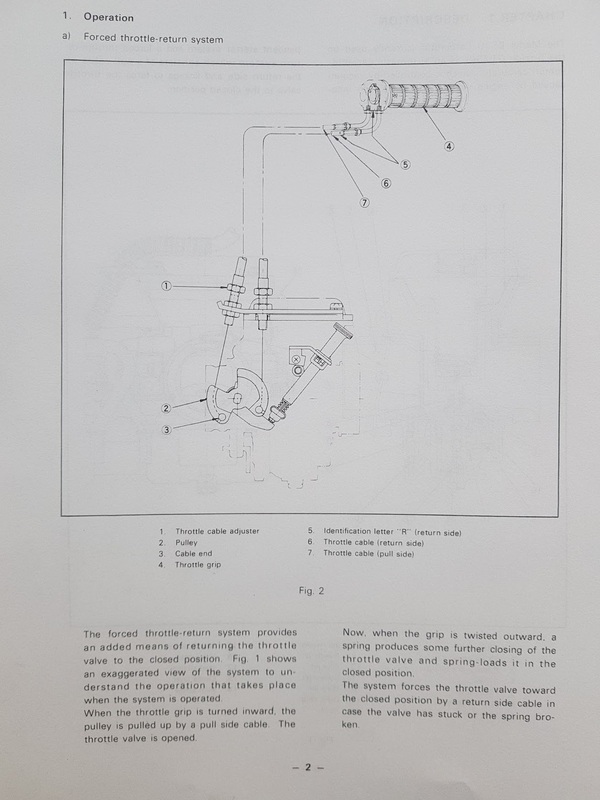 Open the Suzuki carburetors service manual for more information. Yes, you find it on my blog. 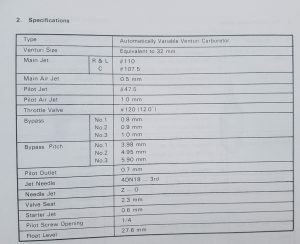 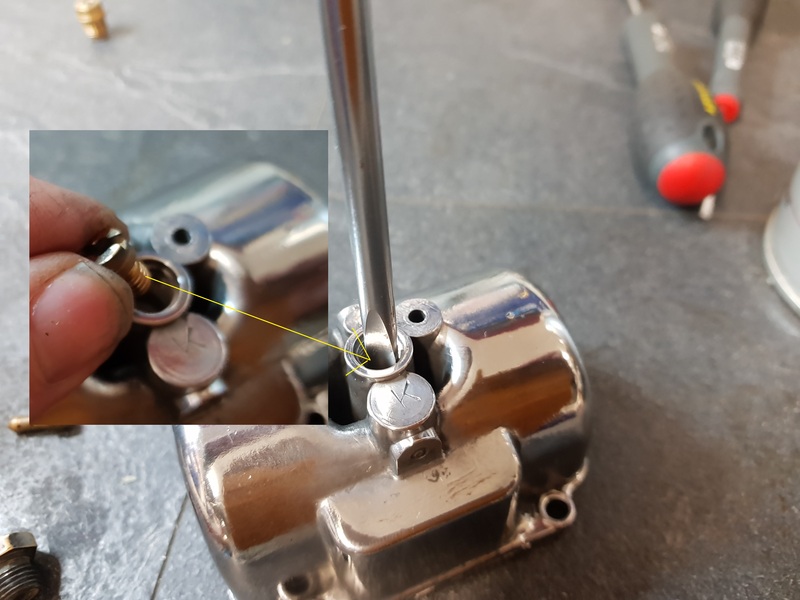 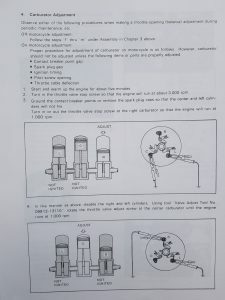 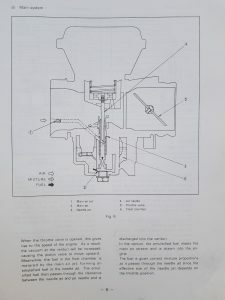 If the original needle valve is used the height should be 27,6 mm .Some of the aftermarket needle valve should be adjustet to 26mm due to a bit different design. Do the adjustment by bending the tab touching the needle valve. 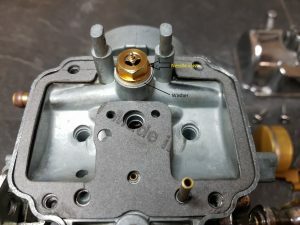 Tilt the carb about 15-20 degrees to avoid the gravity to influence on the float and the needle while you do the measurement. The correct size is 110 for the right and left carb. 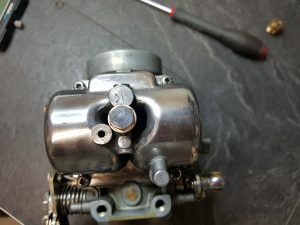 107,5 for the center carb. 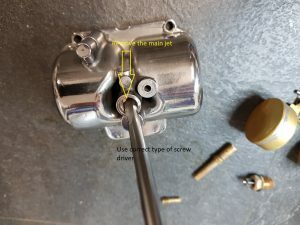 Screw in the pilot jet. Firm, but do not over tighten. 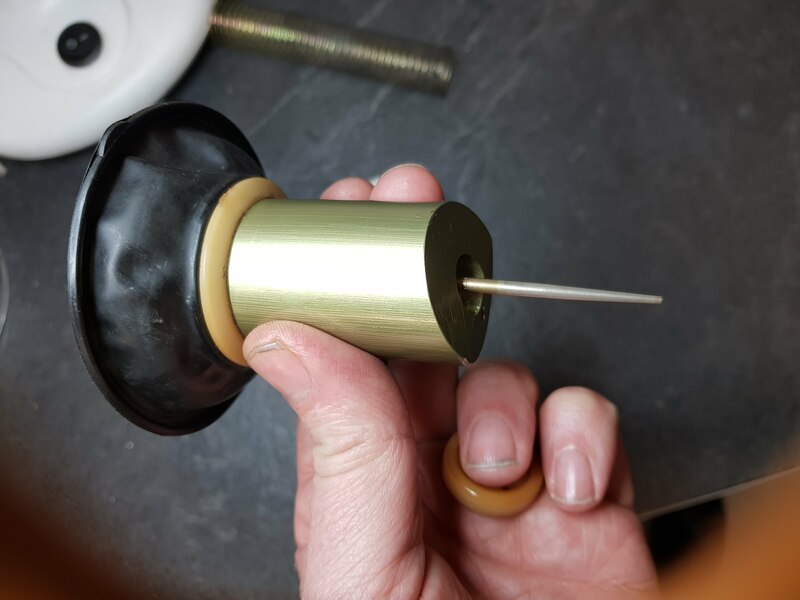 Fit the float chamber with the four screws. Dip the float into boiling water. 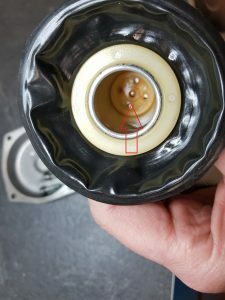 If you spot any bubbles from the float there are a leakages. 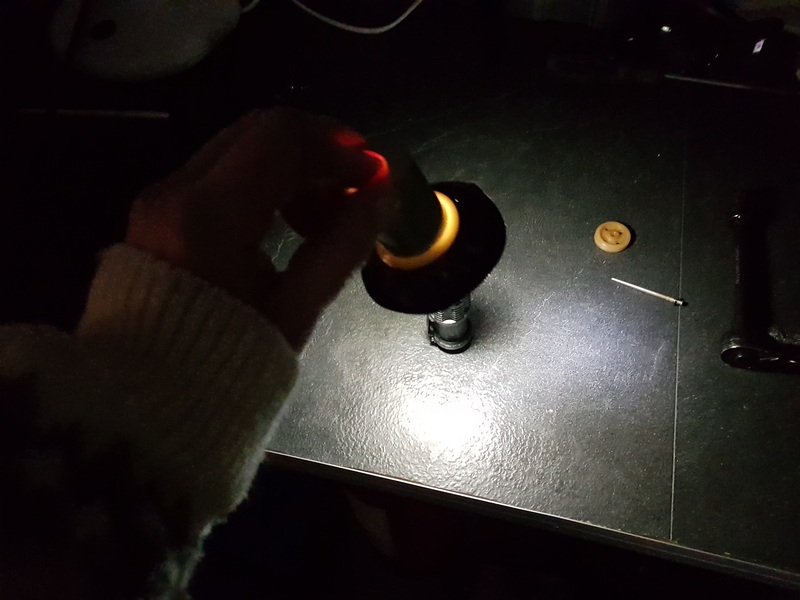 Very hard to solder a bad one, buy a new float. 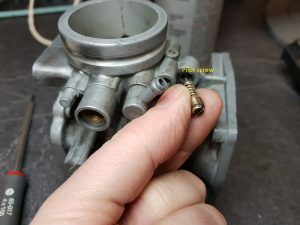 The needle jet require new O-ring. 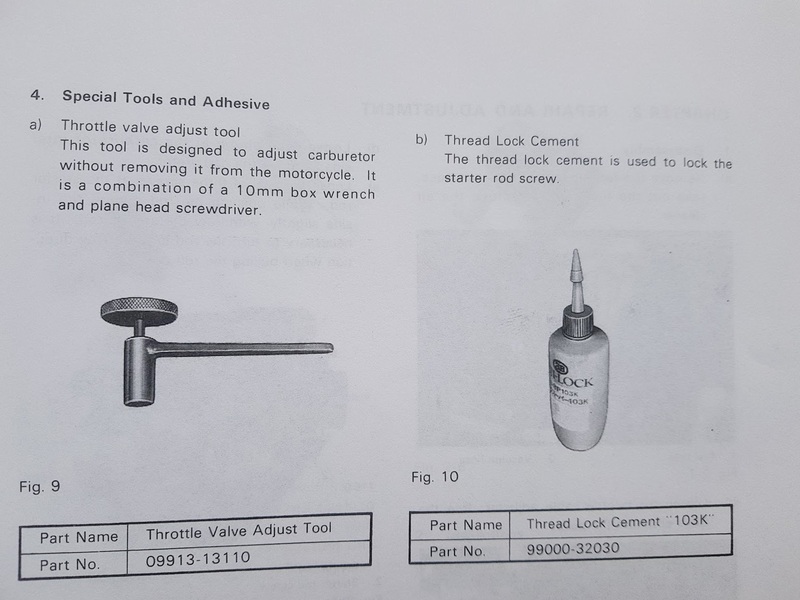 Always replace the old one. 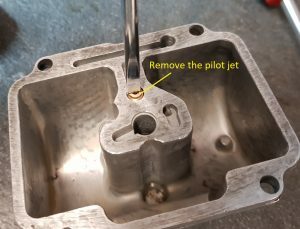 Removal of the main jet. Removal of the pilot jet.